Operational management of Villages Nature transferred to Pierre & Vacances-Center Parcs. Villages Nature In a press release issued on 21 October 2016, Euro Disney S.C.A. and Pierre & Vacances-Center Parcs announced they have agreed to transfer the commercial and operational management of Villages Nature to Pierre & Vacances-Center Parcs. Villages Nature is a joint subsidiary created on equal terms by Euro Disney S.C.A. and the Pierre & Vacances-Center Parcs Group, the Company is the project owner for the design, development, construction and operational planning for “Villages Nature”. 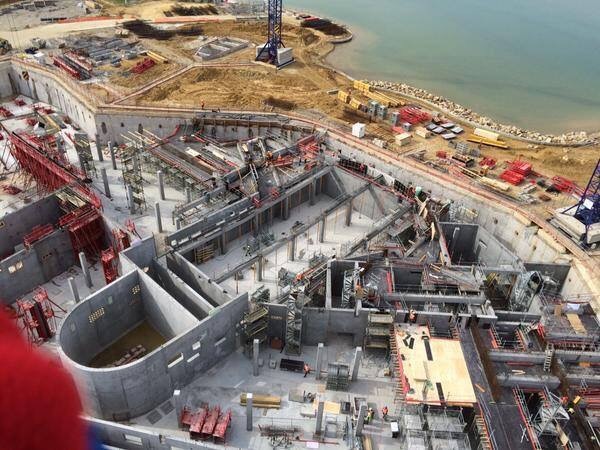 The estimated investment for phase 1A amounts to €500 million. It will be a unique European destination for short and longer breaks, founded on the quest for harmony between man and nature and constituting a major innovation in terms of sustainable family tourism. This new destination for Île-de-France will give its guests the chance to discover Paris and Disneyland® Paris, as well as the wealth of other sites in Île-de-France. The objective is to bring together discovery of this region and a whole world of unique experiences, at the heart of a nature both preserved and enhanced by man. Developed over 120 hectares at its opening, Villages Nature will offer several areas for discovery, recreation, and relaxation, including its Aqualagoon, Lakeside Promenade, Extraordinary Gardens, BelleVie Farm, and the Enchanted Forest. The two partners have agreed to transfer the commercial and operational management of Villages Nature, by mandate, to a subsidiary of Pierre & Vacances-Center Parcs. Euro Disney and Pierre & Vacances-Center Parcs have complementary expertise, which have served as the foundation of their joint-venture partnership since its beginning. The governance of this partnership remains unchanged. Euro Disney provides Villages Nature with its creativity, its art of storytelling, and its unrivalled expertise in theme park and hotel development as well as its knowledge of European tourism markets in terms of quality of the experience and stay. Pierre & Vacances-Center Parcs is the leader in the European holiday market, and the inventor of residence tourism. The Group is a specialist in real estate design, development, and sale, as well as in tourism commercialization, and the management of this type of destination. It will bring its expertise in these areas and its knowledge of distribution networks for the Center Parcs brand to Villages Nature. The first construction phase of the Villages Nature project includes 916 cottages and apartments with a capacity of 4,500 holiday-goers, and will be completed and operational in the summer 2017. To achieve greater operational efficiency and wider distribution, the tourism management of Villages Nature will be transferred to a subsidiary of Pierre & Vacances under the framework of a mandate granted by the operating company of Villages Nature. “Villages Nature is an exciting and innovative project at the heart of eco-tourism. We are working closely with our partners, Pierre & Vacances-Center Parcs, each of us contributing our respective expertise in tourism and development, to harness the growing importance of sustainable tourism and make Villages Nature the top eco-tourism destination in the region” said Catherine Powell, Présidente of Euro Disney S.A.S. Prices for apartments and cottages start from €250,000. More information about investment opportunities at Villages Nature can be found here. The Pierre & Vacances-Center Parcs Group is the European leader in local tourism, created in 1967, the Group develops innovative leisure and holiday concepts in respect of the environment in order to offer its clients the most attractive seaside, mountain, countryside and city centre destinations. With its complementary tourism brands – Pierre & Vacances, Pierre & Vacances premium, Center Parcs, Sunparks, Aparthotels Adagio and Maeva – the Group welcomes 7.5 million customers and operates a tourism network of approximately 50,000 homes and apartments located in 300 sites in Europe. The Group’s holding company – Pierre et Vacances SA – trades at the Paris stock exchange on Euronext Paris. 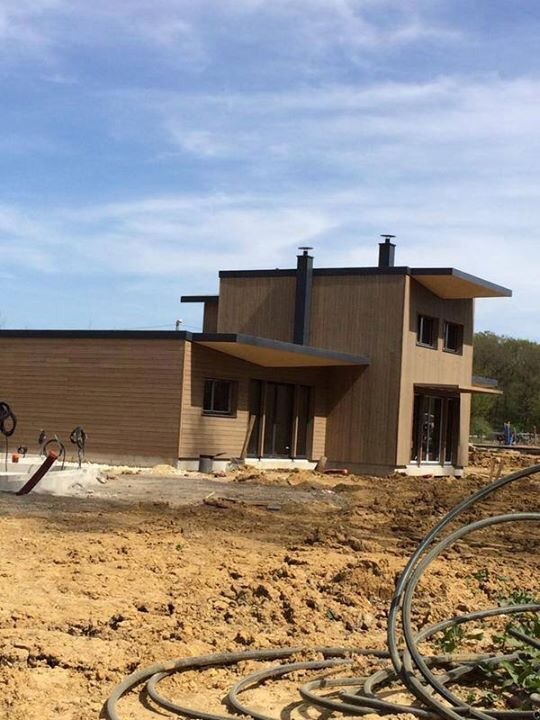 Construction is well underway at Villagers Nature, a joint venture between Pierre & Vacances Center Parcs and Euro Disney S.C.A. 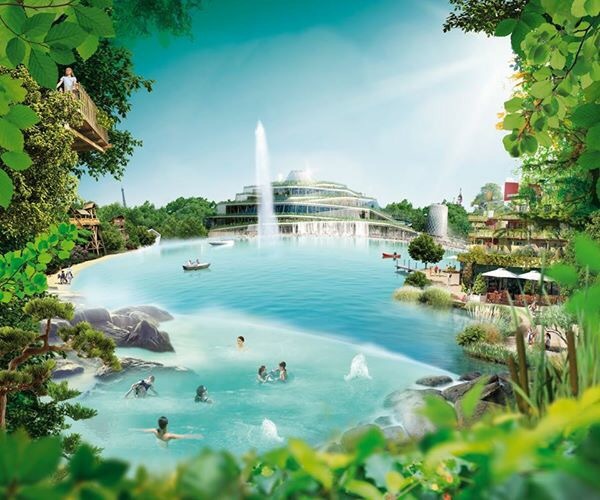 The Villages Nature resort will feature Europe’s largest indoor water park and an open-air lagoon heated to 30°C by geothermal energy. There will also be an adventure island, gardens and an organic farm. 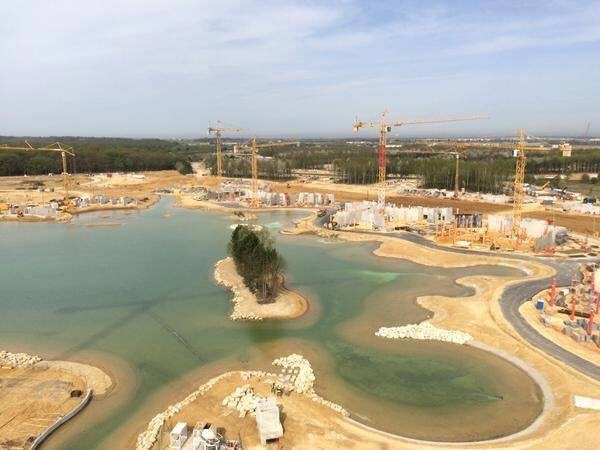 Villages Nature is scheduled to open in 2016 and is located 3 miles south of Disneyland Paris, north of the Brie Forest, near to Disney’s Davy Crockett Ranch in Seine-et-Marne. The project, which could span up to 500 hectares will be developed over a 20 year time-frame, and will feature 1,730 apartments and cottages, equivalent to two Disney hotels or two Center Parcs. Ownership and investment opportunities are available at Villages Nature with apartments starting at €214,500 (£158,690). More information about purchasing an apartment or cottage can be found on the Villages Nature Investment website.